Airports and airlines that begin their formal aviation safety management system implementation need a road map to ensure they understand what is required of them. Some civil aviation authorities offer explicit guidance on their SMS implementation, such as structured SMS implementation plans. For example, Transport Canada, FAA, CASA and ICAO offer an outline (or model) as to what is required in an aviation SMS system. The best way to look at implementing your SMS system is like eating an elephant. If you don't know how to eat an elephant, you do it one bite at a time. Implementing your SMS system time wise is also like eating an elephant, i.e., you won't do it overnight. For most airlines and airports, the SMS system implementation normally takes between three to five years. Using a structured approach to implementing your SMS system is not only convenient, but necessary. Since this SMS implementation is expected to take several year, you can expect employee turnovers, resistance to change, changing environmental and operating conditions and perhaps different SMS auditors. For that reason, your SMS system implementation will have to be very well documented and follow a plan. This plan will be broken out in phases, such as the ICAO SMS Implementation Plan (four phases), FAA SMS Implementation Plan (four phases); and Transport Canada SMS Implementation Plan (also four phases). Following a structured SMS implementation plan allows you to not only know where you are going, but also to allow others to visualize the path that you, as an aviation safety manager, are leading them down. A structured plan will also allow you to measure progress, set goals and allow mentors, consultants and auditors to see where you are going and whether you are heading down the right path. What is Aviation SMS Implementation? An aviation SMS implementation requires your organization to satisfy certain regulatory requirements or standards that demonstrate your company has a fully functional aviation safety management system. These requirement are based on a model that is popular in your particular industry segment. In most cases, the ICAO SMS system implementation will satisfactorily address most requirements that other agencies require. After all, ICAO wrote the regulations and it is up to the states to enforce these regulations. Not all SMS implementation models are exactly the same. They are all based on the ICAO SMS implementation plan and may have been interpreted differently by a bureaucrat or by an overzealous SMS professional who thought a particular SMS element required "beefing up." Why Have Structured Aviation SMS Implementations? When airlines and airports neglect to implement their SMS systems in an organized manner, they are wasting time and money. This is a pure and simple fact. The structured approach ensures your safety team knows the requirements and can work together to ensure the requirements are met in a systematic fashion. A structured SMS system implementation will also have adequate documentation. There will be ample documentation when the "SMS project" is handed over to another manager to resume. It is very common for airlines and airports to fail their SMS system implementation. When this failure occurs, another manager moves in to resume the implementation. Having a structured, well-documented SMS system implementation will communicate to the new manager not only the requirements of the system, but also the progress previously made. Who Manages Aviation SMS Implementations? In most airlines and airports, the safety manager or director of safety manages the SMS system implementation. Larger airlines and airports may have a safety team or committee managing the SMS implementation. In all cases, the accountable executive (top management) is responsible for the successful implementation of the SMS system; therefore, this accountable executive must be actively involved during each phase. How are Aviation SMS Implementations Managed? Depending on the complexity of your organization and the available resources, the tools available for SMS implementation will vary. For two years, SMS Pro offered a free aviation SMS implementation plan manager. This free Web based product allowed safety managers to choose a model, such as the FAA or ICAO SMS implementation plan. More information about SMS Pro's SMS Implementation Plan Manager can be found later on the page. Smaller operators may manage their SMS system implementation on MS Word or paper. This is a very common approach that leads to incredible amount of frustration. Managing your SMS system implementation should be a very easy task and allow all team members, including the accountable executive, to view progress, milestones and deficiencies. When are Aviation SMS Plans Implemented? Formal aviation SMS systems are only implemented when the airline or airport needs something, such as to pass a regulatory audit, satisfy a requirement for a new or existing contract or to obtain a higher certification level. Aviation SMS systems are seldom implemented because management wants to do "the right thing." Implementing a formal aviation SMS program requires time, money and long-term commitment from upper management. Aviation SMS Implementation Plan Manager is used to plan and manage aviation SMS implementation. Operators can use preloaded ICAO or Transport Canada implementation plans or create their own. Managers can track and measure their SMS implementation progress very easily. Implementing an effective SMS is a time-consuming task for aviation service providers. First, one must understand what is required, determine what an organization already has implemented and then calculate a plan for implementing the shortcomings. SMS Pro's Implementation Plan Manager has customizable implementation templates built ready to use. These templates come from ICAO and Transport Canada. Follow the step by step approach to implementing your aviation SMS. 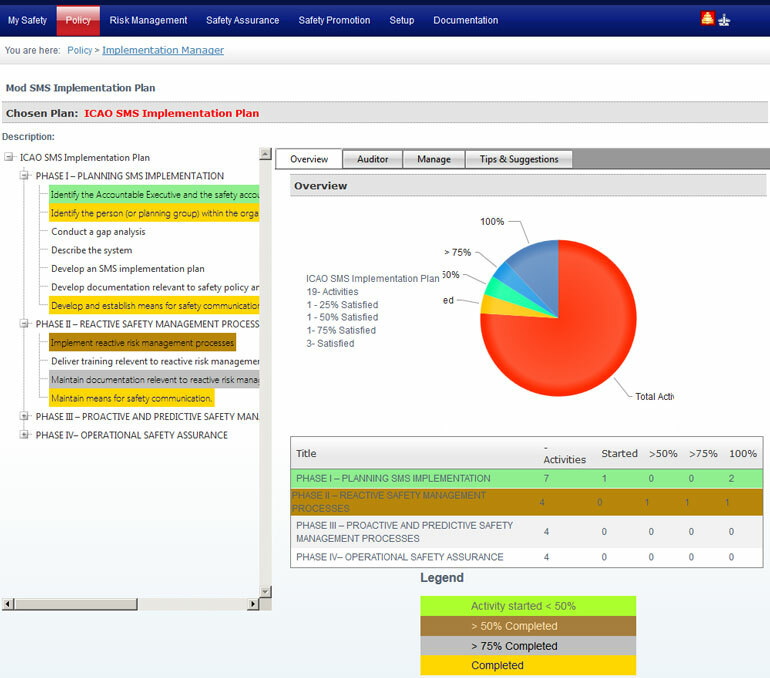 The Implementation Plan manager is a great tool to conduct an initial gap analysis. Alternatively, managers can conduct a gap analysis using the Gap Analysis tool, and then use the Implementation Plan Manager to construct a "plan of action."